I've been working with iPhone data for several years. I love it, because I get to help people recover valuable and sentimental data every day (like photos of newborn babies, voicemails from deceased loved ones, and records for court). I also hate it, because sometimes I have to tell people that there is nothing I can do and their data is lost. If there is one thing that I've learned from all of these interactions, it's that to most of us, iOS data management and backup is a mystery that we hope will pleasantly surprise us one day. I'd like to take some time to remove some of the mystique, and give everyone some much needed peace of mind. Things you store using iCloud services are stored remotely on servers owned by Apple. The primary benefit to this is that you're not responsible for taking care of those servers. When you change computers, you don't need to think about migrating any of your backups or iTunes synced data to the new computer. You don't have to physically plug your iPhone into a computer to use iCloud services, but you do need a stable connection to the internet. The primary detriment to this is that you may not like having your data stored on Apple's servers. Anyone with your Apple ID and password could possibly access that data. (Edit: Excellent additional point added by one of our readers, beancounter.) The free iCloud storage plan is currently limited to 5GB, with paid plans for more storage. If you don't want to pay for more iCloud capacity, you may not have enough space to backup all of your devices and cloud sync a lot of documents. The automatic iCloud backups sometimes don't happen (or have a problem completing), so even though they are “automatic”, they need to be checked on periodically. Things you store using iTunes are stored locally on your computer. The primary benefit to this is that you are the full owner of this data, can tangibly see the files on your computer, and can do with them what you want. You do have to physically plug your iPhone into the computer (or use iTunes wireless sync), but you do not need an internet connection and USB communication is much faster than typical internet connectivity speeds. The primary detriment to this is that you are responsible for the health of your computer, and periodically remembering to plug in and transfer your data. When you plug your iPhone/iPad/iPod Touch into your computer and run iTunes, there are three forms of communication that you can request between your computer and the device: syncing, backing up, and transferring purchases. Somewhat infrequently, iTunes will make a backup of your device. You can tell this is happening because the iTunes status window (at the top of the iTunes window) will say “Backing up Device Name.” You can also force a backup in iTunes by pressing the "Back Up Now" button in the device summary section of iTunes. The device backups contains all of the device's data that isn't put there via a sync. The reasoning for this is that items you sync to a device are already stored on your computer, and if you lose them on your device, they can just be synced again. Apps themselves are not backed up (because they are re-downloaded from the App Store, or synced via iTunes) but the data stored by that app is backed up. Music is not backed up, because it is synced or downloaded from iCloud music or the iTunes store. The camera roll is backed up, but your synced photo libraries are not backed up. iBooks PDFs are not backed up. Here's a whole separate post about how iOS stores iBooks PDFs, covering both cases of whether you sync your iBooks in iCloud or not. Voicemails, text messages, notes, voice memos, etc are all backed up. The total list of what is backed up can be found here. The link above also discusses how passwords and Activity data are not backed up unless the backup is encrypted. If you ever need to restore your device, the data from the last backup is used. For the most part, when you make a new backup in iTunes, iTunes just updates/overwrites the previous backup. I have to say it explicitly once in this article: Syncing does not make a backup. To force a backup in iTunes, press the "Back Up Now" button in the device summary section of iTunes. We're going to talk more about iCloud in a future post, but if you'd like to read more about iCloud vs iTunes backups, here is my article on that. Syncing is the most common communication between iTunes and your device, and it is what usually happens when you plug your iPhone into your computer. 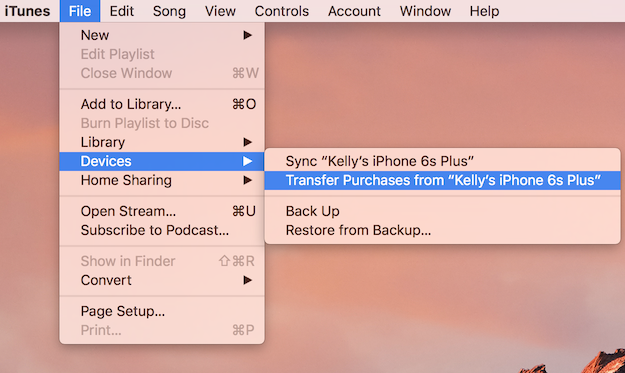 During a sync, iTunes makes sure that items on your computer are transferred to your iPhone. Photos, music, movies, etc that are stored on your computer and selected to sync in iTunes will be copied to your device if they are not already there. The one caveat to this is if you sync contacts or calendars in iTunes. In that case, iTunes tries it's best to reconcile contacts/events on your computer with what is on your iPhone and make both up-to-date with each other. This is a two-way transfer, versus every other sync, that is strictly computer to device. You copy music, movies, ringtones, and iBooks purchased from the iTunes Store/iBooks Store from your device to your computer by going to the File menu in iTunes -> Devices -> Transfer Purchases from “Your Device Name”. iBooks PDFs used to be stored in the iPhone backups, but those PDFs are no longer part of the backup. This post used to contain the crazy workaround to get the iBooks PDFs into iTunes, but thankfully that's no longer necessary. Update: I wrote a whole separate post on copying iBooks PDFs to your computer, since the question is so popular... and so confusing. Screen time is my issue. After (finally) updating to ios 12, suddenly (!!!) I had screen time turned ON AND it's shutting me down from 10pm-7am every night! I apparently made a mysterious restrictions password at some point (???) and after having tried every 4 digit I might have used (most common ones) and 40 combinations as well LOL, all of which do not work, I have been told I have to restore to a new state. Ok. But also have been told that to backup is useless because to restore from a backup would just bring back the "unremembered" restriction code. I have heard something about the DFU mode? Could this be used? Then instead of restoring from ANY backup, I could just SYNC to get back photos, contacts, and the like? Ironically, I have an IPad synced to my phone but it did not have screen time turned on by default. Yes, the ScreenTime passcode is stored in the backup, but that post talks about using the backup to help you recover the passcode. I recently purchased GoodReader as a way to manage my PDF files which were previously stored in iBooks. Is there a way to transfer multiple PDF files from iBooks to GoodReader without emailing each one individually which will take forever? My Ipad (as a whole) is backed up automatically via wireless internet whenever I charge it. I guess that means the Cloud but I don't specifically do anything with ICloud. Sorry to sound so out to lunch. I been using iCloud but didn't want to use iCloud cause 5GB was insufficient and didn't want pay subscription to Apple. So instead use iTunes. I wasn't really aware you had to use encrypted if you wanted your saved passwords to remain. Apple really need to make warning on this one. I only realised when I tested the backup all my passwords were losted. But the gotcha for me was to backup via iTunes I need to disable the backup of iCloud, but would allow keeping a copy locally. But when iTunes then backups it seem to assume these files are still in the iCloud. So when I used the iTunes backup all these files were wiped. They really need to fix so not possible for lose and a combination of both, where you happy for configuration, settings, passwords back up to iCloud but large files via iTunes. My phone has been going to a black screen and resetting since the update. I am pretty much down to the restore option. Right now the phone is not doing anything. I hope it will. If I back it up to my hard drive, will that just copy my problem on top of my somewhat dated, but functional backup? Yes - making a new backup usually overwrites the previous backup, but here's some instructions to "set aside" the old backup so that iTunes doesn't use it for an incremental backup. 3. Now when you make the new backup, iTunes will make a new UDID-named folder and make the new backup from scratch rather than updating the old one. Thank you for your quick reply and for breaking it down. I appreciate it. Help!!! Stepdad wanted to save a copy of some photos on my mother's laptop. Not knowing how to use iTunes he proceeded to plug iphone into laptop and iTunes launched automatically. Apparently, it was set to auto sync, and my mother's old iPhone was the only thing that had been previously plugged to it. It appears it synced her data with his phone. He lost many important business contacts and 2 years worth of photos. Before this incident, his iPhone had never been plugged to a computer, and I don't think he has ever used iCloud. Is there any chance that all the photos and contacts from his phone are saved somewhere? Does iTunes ever automatically back up before it auto syncs? It may have been an accident where on that first new device screen, "restore from backup" was picked instead of "setup as a new device" (which is a confusing screen to say the least). Hopefully one of those emergency backups of the iPhone was made before restoring the old backup of your mother's old iPhone to you step-dad's iPhone. Hey Kelly. I see in your post you mention all VMs are backed up. I recently upgraded to a new phone and a lot of my older VMs did not come back on my phone when I restored. I can't seem to find where my backup files are on my mac? Should I be able to find and listen to the VMs on my computer? Do you remember if you had to switch your SIM card into the new iPhone AFTER restoring the backup? The voicemails may have been in the backup, but if they were not from the "same phone number" as what was on the iPhone at the time of the restore, iOS may have deleted them during boot up. If that's the case, and it hasn't been too long using the new iPhone (that restoring the old backup again wouldn't be too painful, overwriting your new data) you could try the restore again. Ah yay I'm glad your dad got the iPhone working! There's not a good way to merge the two backups, but if the data is still on the old iPhone 6 - wouldn't a new backup of the iPhone 6 have all of the data on it? Maybe there is something I am missing in the situation, so let me know if so! Ah ok I understand now! We don't have any tools to merge the new contents and the old backup sadly, and yes as you are worried about, restoring the old backup will overwrite the new data. Depending on what you need, you could use something like Decipher Backup Browser to get the photos out of the old iPhone backup that were in-between, or actually you could plug in the iPhone and import the photos directly! We were afraid of that! Thanks so much! Hi. I just upgraded my iPhone 7 to the X and my phone indicates that it is done restoring my info. But so many of my voicemails are missing. Important ones, from my father, who passed suddenly in May. Where did these go? Can they be recovered? Any help is very much appreciated. We're sorry to hear about your loss, and definitely understand how important those voicemails are. When you upgraded to the iPhone X, did you need to put your old SIM card from the iPhone 7 into the iPhone X --- or did you restore the backup before activating the new SIM card? If not, ignore all of this paragraph ;) If you did have to switch your SIM card or activate the new SIM, and you restored the backup before switching/activating the SIM card, the Phone app likely dropped the older voicemails because they were for a "different number" than the temporary SIM card in the iPhone. If that's the case... and you haven't done much important since you set up the iPhone X, you could try restoring the old backup now that you're up and running with "your number" on your phone now. Alternatively, we do have software to see if the voicemails are in the iPhone 7 backup, and save the audio files to you computer if so. https://deciphertools.com/d... But I can understand wanting to get them restoring to your new iPhone now too! Btw, I think that iTunes is a pretty confusing program. I need to spend a few days just reading a manual for it. Also, as far as back ups, there should be options for choosing what we want to back up and changing the back up file location. It seems almost like common sense to have these features. This is a very useful article. However, you suggest that all app data is backed up (apart from iBooks). This may lead to disappointment. There are a number of apps whose data is not backed up. I have at least one (ForScore, a music score app - essentially a pdf manager) which does not. I suspect that video players also may not. As a consequence, I don’t dare switch back to an old iOS (which I need to do to retrieve data from a no longer supported app) for fear of a current backup being incomplete. Do you have any hints on ensuring all data is backed up? I used another iPhone while mine was being repaired. How do I get my new chats and pictures onto my old phone? Can this be done from iTunes backup without resetting ? You should be able to restore a backup of your temporary iPhone (iCloud or iTunes backup) to your repaired iPhone. This will REPLACE the contents of the old iPhone with the contents of the new backup. There isn't a way to merge the data with backups (if that is what you're asking). This is what I understand and a few question. 1. If I just backup my iPhone, I don't need to sync it immediately to make sure everything is in the same page. 2. If I sync my iPhone, the backup in local drive will be updated. In that case, when something is mess up in the current state of the iPhone, will a new sync mess-up the latest backup copy. OR the sync content will be separate from the latest backup and will not merged until the next backup? 3. Why some, if not all, of the setting from Apple and 3rd party will be reset after complete restore? Isn't the backup should make the iPhone restored to the exactly same iPhone as when it was backup? 4. Is there a way to retain preference and history, e.g. game record? Like copy the preference file to another location and put it back to iPhone? 5. Can I single out content from iPhone backup and restore it back to iPhone or save it as a readable file, e.g., jpg, text or app? 6. Is there an easier and efficient way to manage photo in iPhone via Mac? Photo in mac is so underpowered and dumb. my iphone is runing low on space and it is annoying. All of my photos are uploaded to icloud . lets get to the point if my photos are uploaded to icloud will they still be uploaded to my pc by itunes. All of the photos are on icloud. I am thinking about restoring my iphone. This may be helpful: https://support.apple.com/e... - Apple lists "Photos already stored in the cloud, like My Photo Stream, and iCloud Photo Library" as part of the list of things NOT included in the iTunes backup. So if you're using iCloud Photos, then your photos won't be in the iTunes (or iCloud) backup as well. If you see iTunes showing a progress bar and saying Backing Up, then it was running a backup then. It won't always do that when you're done syncing though, if that is what you're asking. When I upgrade (for more storage) I get this message: "An older item named “Decipher TextMessage” already exists in this location. Do you want to replace it with the newer one you’re moving?" Question: If I REPLACE the older app with the newer one, DO I LOSE THE INFO IN THE OLDER APP - OR ARE THEY MERGED? Hi J! They should be merged (well, shared), because we store the app data in the appropriate spot for user data rather than in the app itself. It's safe to replace! So how do I get my PDFs back from a windows computer ?? Assuming that's what you're asking: Go into your user accounts Music folder -> iTunes -> iTunes Media -> Books, and the PDFs transferred with Transfer Purchases should be in there! Or, if you want them back on your iPhone, check the box to Sync Books in iTunes -> Your iPhone -> Books subsection. I accumulated hundreds of screenshots from a language dictionary on my iPhone so decided to use iBooks to convert those screenshots into a PDF so that I could delete the screenshots and make some space on my iPhone. The problem is there's no email link or iCloud transfer button so that I can get them onto my computer. They aren't showing in the books window, only purchases and they aren't showing in my device menu anywhere. I'm freaking out at this point because I've accumulated these words over a long period of time and Ive already deleted the screenshots from my iPhone. If it's still not working, let me know if you're on Windows or Mac. We may need to take this to email too so I can ask for screenshots of what you're seeing. But hopefully the instructions in the other post will help! I've tried to find the answer to this: If you check the box in iTunes to prevent your iPhone from syncing automatically, will iTunes still make backups when you click "Sync", or do you need to choose "Back Up Now"? Sometimes pressing "Sync" will also trigger a backup to be done, but not always. (I wish I had some sort of definition of how iTunes decides that.) The auto sync checkbox doesn't change that. I would always press Back Up Now if you want to make a backup, and not rely on the Sync to do it. So preventing automatic syncing doesn't require manual backups? It just means that backups might happen when you press "Sync" as opposed to when you connect the phone, correct? Which part are you referring to? Backup, sync, and transfer purchases are all still part of the iTunes ecosystem in iOS 10. The post needs to be updated for iCloud music users, but I'd love your feedback about which part you took issue with. I was referring the transfer purchases of apps. Apps are no longer copied to your Mac/Pc. I just received a new Macbook from work and I would like to use it to make a backup of my iPhone 6. I backup to iCloud every night but I would like an iTunes backup because I have some applications that are no longer available for purchase in the App store. I have an old Macbook which I used to use for iTunes backups but it no longer has hard drive space to create an iTunes backup. So I want to run an iTunes backup using my new Macbook but my question is, when I run the iTunes Backup, will it transfer all my purchased apps from my iPhone even if they are no longer available in the App Store? Also, is it possible to run the iTunes Back up without syncing since I don't want any information on my new MacBook to be synced to my iPhone 6? Thank you in advance for your help! 1) Transfer purchases (from the File -> Devices menu in iTunes) *should* copy those apps to your new Macbook. Making a backup may initiate a transfer purchases, but running it yourself (a couple times, actually) is better. After transferring the purchases, you can go look in the "Apps" section of the iTunes library (not the device section) and verify that those old apps transferred. 2) Yes, you can make a backup without syncing. Thanks for the help! Is there anything you need to do to make the backup without syncing? Every time I click Back Up now in iTunes it says Syncing with iPhone. I'm not sure if it's trying to sync all information or just transferring the purchases from my iPhone onto the Macbook and labeling that as "Syncing". Thanks again! I'd love to know the difference between right-click, "Send to device" from music, and syncing checked music. Under tools there is an option to reencode music at a lower bitrate to save space for syncing only; I assume that that does not happen for "Send to device"? Where are you seeing "Send to Device"? I know of that option in some third party tools, but can't find it in iTunes when I right-click a song. iTunes for Windows, when I right-click on a single song or selection with the phone plugged in.. I find iTunes confusing and riddled with ambiguities. The whole concept of "synching" is ambiguous. It's not a precisely defined term, at least without a LOT of research, which is soon forgotten if not done frequently. It would be far better to use terminology with obvious meanings, like "upload" or "download" a file or folder. "Synching" allows misunderstandings that can cause loss of data, unintentional transfers resulting in security breaches, etc. Also, in iTunes so much is hidden in hard to find places. Trying to transfer photos from a PC to iPad is exasperating.The photos option never shows up where you would expect. For example, you can try to import photo files or folders to the library, but nothing shows up. Why are photos not in the left-pane with all the other categories, like movies, music, books, PDF's, etc? That is inconsistent. Photos FINALLY show up (but not in the left pane) when the synching page opens AFTER connecting the iPad. But then there are odd lock-outs of what you really want to do. Then, when you think you are ready, it does the "synch" thing, where you really don't know what will happen. All I wanted to do was transfer some photos to my iPad - a very simple concept that shouldn't be accompanied by so much nonsense. It shouldn't be cryptic and obscure. I hate to say it but iTunes does NOT live up to Apple's reputation for user friendly interfaces. Thank you for the Bonus Tirade! I have 750 PDFs in iPad iBooks. I read in an Apple Community that upgrading to iOS 9.0.3 destroys PDFs. Do you know if this is true? Do I want to email 750 PDFs? Do I want to print them? No. That's why they are in iBooks. I backed them up to iTunes on Mac El Capitan but what is backed up are IDs & pointer or address data--not the PDFs content. My PDFs are a mix of deadly serious research, legally obtained from the Internet, and purchases from indie designers whose sites may not support re-downloads. Microsoft is beginning to look "not so awful". I have, using Microsoft provided tools, gotten inside Microsoft software and bludgeoned it into working--can't do that with iPad/Mac. My PDFs represent a zillion hours of work and $$$$ and Apple is not backing up PDFs simply because I didn't buy from them stuff they don't sell. I have owned Apple products since 1987 because they invested in the user experience. Now they invest in shaving a mm off product thickness and different case colors. Sooo disillusioned.....really sad. Can you try doing a "Transfer Purchases" in iTunes and see if your PDFs are copied into your books library now? I need to update this blog post if so, but I think transferring should copy them into your iBooks library (which is "kind of" a thing now) so they're syncable now. After you do the Transfer Purchases, you should see all of the PDFs in the Books syncing settings in iTunes and/or the iBooks app. Let me know, so I can make sure I get this post edited! Kelly, it worked! I had just now typed out exactly what transferred but my message disappeared. If it doesn't arrive, in summary, I had already tried Transfer Purchases and got only books. Today, following your suggestion, I tried again. Watched (in iBooks) PDFs galore downloading. If you want a more thorough description, let me know. Many, many thanks--that was an inspired suggestion. Can you describe it more specific please? I have many PDF also, lots of documents that i made pdf from photo and such. But doesnt matter how i try, i cant see my PDFs. Not in iTunes, not in any other program i tried. I have them shared with ipad-iphone with icloud, but i cant open icloud to download them. Icloud is a total disappointment also, i can see ibooks folder using space, but cant do anything else to it, only delete. It doesnt even show how many or what i have, only 1 directory. So im totally lost, couldnt find any way to get my pdfs on PC. Sending them with mail doesnt work either, many of them are much higher than the mail system can handle. From the File menu, select Devices, and then Transfer Purchases from (your iPhone name). Let's see if the PDFs appear in the Books section for syncing after that? Many thanks for the backup/transfer of the PDFs from the iPad. Would very much like to be able to move the PDFs to another backup device. Please post when you develop this capability. Again, many thanks. Kelly....thanks for your commitment and help trying to do what Apple USED to promote as their philosophical basis back in the 80's and 90's---making using a computer user-friendly and attractive, not convoluted, confusing and exasperating. iTunes is designed to be simple to take your money, in my opinion, and difficult to use if all you are trying to do is collect or accumulate files/data and organize. Here is a question for you that I am further exploring because I have some free time and am trying to understand the iTunes jungle---is the iTunes Media Folder the same thing as the Library? Hello Kelly, and thank you for this explanation. I'm migrating to a new iPhone soon, when I realized that on my iBooks, I have some PDFs (well, books actually) which, perhaps due to their huge size, cannot be emailed. The only option I get when selecting such PDFs is to (Print) them. Any idea on how to transfer those? Thank you. Good article but I would like to add one more distinction between backing up to iCloud and your computer - space limitations! icloud provides you with 5 gb of free space. Additional space has to be purchased from Apple. You will have much more space on your computer. This will become an important advantage if you save a lot of pictures on your iPhone. That is an excellent point! I will work it into an edit ASAP!